Have you noticed that Microsoft is continuously developing new (and often great) apps for Android? At the moment, there are over 80 Microsoft-made apps on Google Play, and the number is steadily growing. While many of these applications were originally available on Windows, some have been developed exclusively for Android - including the recently released Kaizala and Mimicker Alarm, or the slightly older Next lock screen and Arrow Launcher. But what can you do if you want to check out the newest Android apps from Microsoft as soon as possible? Well, there's actually an(other) app for that, and it's called... Microsoft Apps. Available to download for free from Google Play - see the source link at the end of this article - Microsoft Apps features two main tabs: Popular, which includes the company's most famous (thus already launched) Android apps, and Categories. In the Categories tab, you'll find virtually all of Microsoft's Android apps, obviously divided into specific categories. Also in this tab you'll discover a "New" section, which has its own two sub-tabs: New Updates (listing the most recently updated apps - including change logs), and New Apps - that's what you need to check if you're looking for the very latest Android apps made by Microsoft. 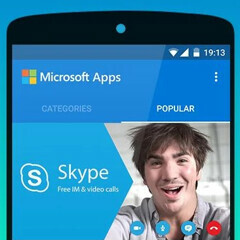 The New Apps tab is updated weekly, which means Microsoft plans to churn out Android applications quite frequently. Of course, you'll probably not see fresh apps on a weekly basis, but at least you know where to look for them. Whenever you find an application within Microsoft Apps (be it new, or already released), you can tap on it to visit its Google Play page, from where you can download it to your device. This is the default window that shows up when you open Microsoft Apps. Since we're interested in new apps, we'll tap on Categories. As you can see, we've placed Microsoft Apps on our home screen. Well, there are no new apps this week, but there's always next week! I feel Microsoft sees this for someone like me- a WP user who is almost all in on MS services (Outlook, Office, Onedrive, Skype, Bing search, heck I even subscribe to Groove music) but has all but accepted they need to move off of Windows mobile. I am waiting to see if any of the W10 devices from other OEM's make it to the States or are worth it, but if not I am giving Android a whirl. But I dislike Google, and want to make it as much a MS driven device as I can even if that means adding a step or two to get things done. Hate that this is what it has come down to, but I believe in dealing with the way things actually are. MS is doing a fantastic job developing top end, constantly improving Android apps. For a user like me, it is a decent plan B. Or you can use Microsoft apps on iOS, without google involvement. So considered it... actually was leaning to it. But Apple products are so overpriced. I can get a really decent, unlocked Moto X Pure or Nexus device (especially the 6, which is dirt cheap new right now) for a lot less pain. I would prefer a no Google situation, but Apple takes themselves very seriously. Wow, downloading apps to download apps... Is this one of the great Android features I'm missing out on as an iOS user? Yes, some apps can even let you download unreleased, modified or even ios apps. That's good, it just seems a messy way to do things to me! Downloading things to download things. There are pro's and cons to all methods I guess. It is just 2 stores to download apps, nothing too complicated. the major cons are safety and developers' revenue. Looks like you were searvhing for sonething to Bash Andoid. Well its just an app that will keep u notified about apps that Microsoft lauchs. You can download them from Playstore directly so it actually does not have demerit. No, I'm always told how great all this customisation is on Android, I've never tried Android properly aside from setting up my mum's Kindle Fire HD (I didn't like it but that may well be the Kindle interface rather than Android) - now if you have to download apps to download apps it seems like a bit of a mess, not "customisation". I'm thinking of trying the smaller HTC 10 if it's out in September so really do want to know the benefits of Android, if the benefits of customisation means putting lots more crap on the phone I don't want then it's not really a benefit. Noone's forcing you to install this app stupid. Microsoft seems to have 72 apps for Android.